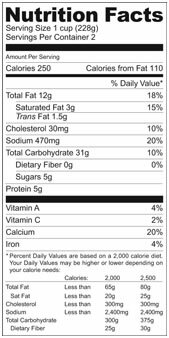 WHAT DOES THE NUTRITION FACTS LABEL SAY? Fat: We all need fats. Fats helps nutrient absorption, nerve transmission, maintaining cell membrane integrity etc. However, when consumed in excess amount, fats contribute to weight gain, heart disease and certain types of cancer. Fats are not created equal. Some fats promote our health positively while others increase our risks of heart disease. The key is to replace bad fats with good fats in our diet. Total fat: Technically speaking, fat is a whole family of compounds called "lipids." They are often categorized as saturated, monosaturated and pollysaturated your "total fat" is all three types added together. On food labels, total fat is usually called just "fat." Fats are the body's most concentrated source of energy. Besides energy, fat helps to deliver certain nutrients to your body. Among them are linoleic acid, which contributes to healthy skin, blood clotting, good kidney function, and fertility; and vitamins A, D, E, and K, which enter your system more readily when dissolved in fat. Fats also figure in the manufacture of hormones, cell membranes, nerve coverings, and prostaglandins (substances that control blood pressure and muscle action in internal organs). Saturated fat: Saturated fat can increase your risk of heart disease and high cholesterol. The average adult should consume no more than 20 grams of saturated fat per day. Foods from animals include beef, beef fat, veal, lamb, pork, lard, poultry fat, butter, cream, milk, cheeses and other dairy products made from whole and 2 percent milk. All of these foods also contain dietary cholesterol. Trans fat: Trans fat also increases your risk of heart disease. Ideally, you should get 0 grams of Trans fat per day. When you read a nutrition label remember that companies are allowed to list the amount of Trans fat as 0 grams? If it contains less than .5 grams of Trans fat per serving. This means that your food can contain some Trans fat even if the nutrition label says 0 grams per serving! Always check the ingredient list for Trans fat, which may be listed as, Hydrogenated vegetable oil or Partially Hydrogenated vegetable oil. Trans fat is usually found in commercially prepared baked goods, fried foods, snack foods and margarine. Cholesterol: You should eat less than 300 milligrams of cholesterol per day (and less than 200 milligrams per day if you have heart disease). Sodium: Can come from natural sources or be added to foods. Most foods in their natural state contain some sodium. However, the majority (up to 75 percent) of sodium that Americans consume comes from sodium added to processed foods by manufacturers. While some of this sodium is added to foods for safety reasons – the amount of salt added to processed foods is clearly above and beyond what is required for safety and function of the food supply. Total carbohydrate: (sugars) Carbohydrate-rich foods are the primary source of energy for all body functions. Your body breaks down carbohydrates, or crabs, into fuel for use by your cells and muscles - that’s why eating a moderate amount of carbohydrates is necessary for most people. There are two types of crabs - sugars and starches. Sugars are simple carbohydrates that can be easily digested by your body and include foods like cake, soda, candy, jellies and fruits. Starches are complex carbohydrates that take longer to be digested and include foods such as breads, grains, pasta, tortillas, noodles, fruits and vegetables. Dietary Fiber Sugars: Also listed under Total Carbohydrate on food labels, sugars are found in most foods. However, the Nutrition Facts label doesn't make the distinction between natural sugars and added sugars. Natural sugars are found in many foods, including fruit and dairy products. Snack foods, candy, and soda often have large amounts of added sugars. To find out if a food has added sugar, you need to look at the ingredient list for sugar, corn syrup or sweetener, dextrose, fructose, honey, or molasses, to name just a few. Avoid products that have sugar or other sweeteners high on the ingredient list. Protein: Proteins are complex organic compounds. The basic structure of protein is a chain of amino acids. A nutritionally balanced dietbalanced diet provides adequate protein. A diet high in meat can contribute to high cholesterol levels or other diseases such as gout. A high-protein diet may also put a strain on the kidneys. Soybeans are the only plant protein considered to be a complete protein. Vitamins and Minerals: Vitamins are organic substances (made by plants or animals), minerals are inorganic elements that come from the earth; soil and water and are absorbed by plants. Animals and humans absorb minerals from the plants they eat. Vitamins and minerals are nutrients that your body needs to grow and develop normally. Vitamins and minerals have a unique role to play in maintaining your health.